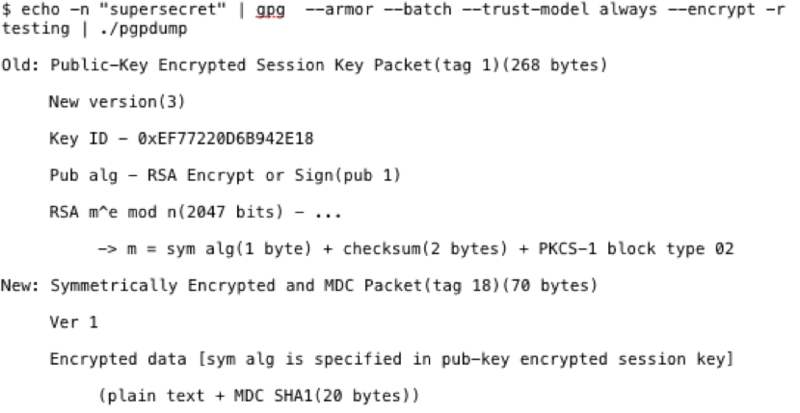 This post takes a quick look at Chef Data-Bags and SaltStack Pillar (GPG.Renderer) and identifies methods to determine if encrypted information leaks details about the plaintext, such as password length, that could aid an attacker. 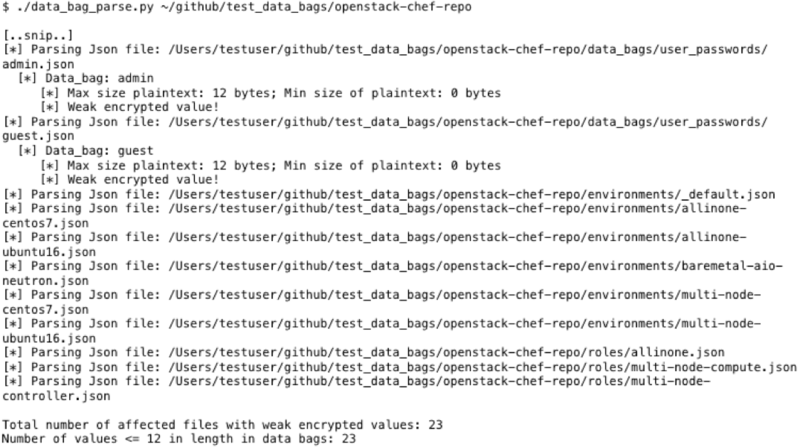 Does your organization, or one you are testing/auditing, use Chef Data Bags or SaltStack Pillar with the GPG.renderer to secure secrets for deployment and operations? If so, you have probably looked at these encrypted blobs of data and thought, "Good they are encrypted!" or "Darn they are encrypted!" Either way, you move on to something else more interesting. Well, let's take a closer look at the encryption algorithms and determine if we can learn something useful. By default, data bags are encrypted using AES-256-CBC using the OpenSSL library via the knife command (written in Ruby). Already we have a couple issues: we know it's an encrypted password and we know the service (mysql). Leaking this information is not too bad, but people put these in their code repositories, then they put them online. The base64 encoded data is 32 bytes long after decoding. 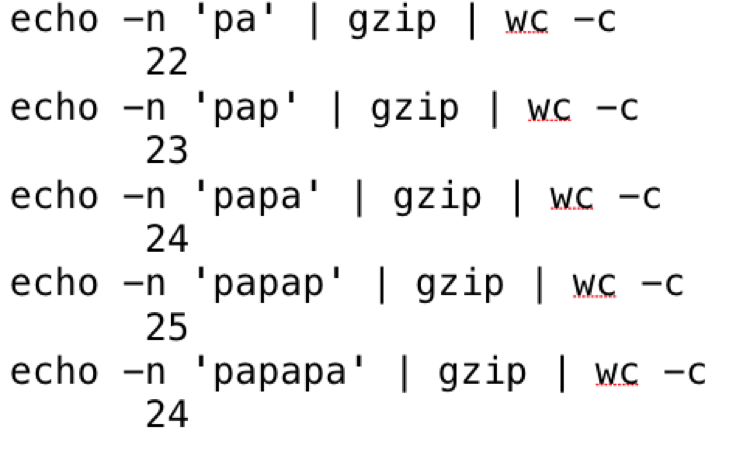 In typical PKCS7 padding fashion, 32 bytes continues to be the encrypted data size until we hit the next block of plaintext size, and in this case it is at 13 bytes of plaintext data. The decoded base64 string is 48 bytes as expected (AES has a 128 bit block size == 16 bytes). The preceding snippet of code was added to a recursive JSON parsing script to find values of data that might be below 13 characters in length. This script is useful to find encrypted passwords that I consider weak. This is important because these passwords are typically used for service or administrative accounts, and as a best practice should be more than 13 characters. 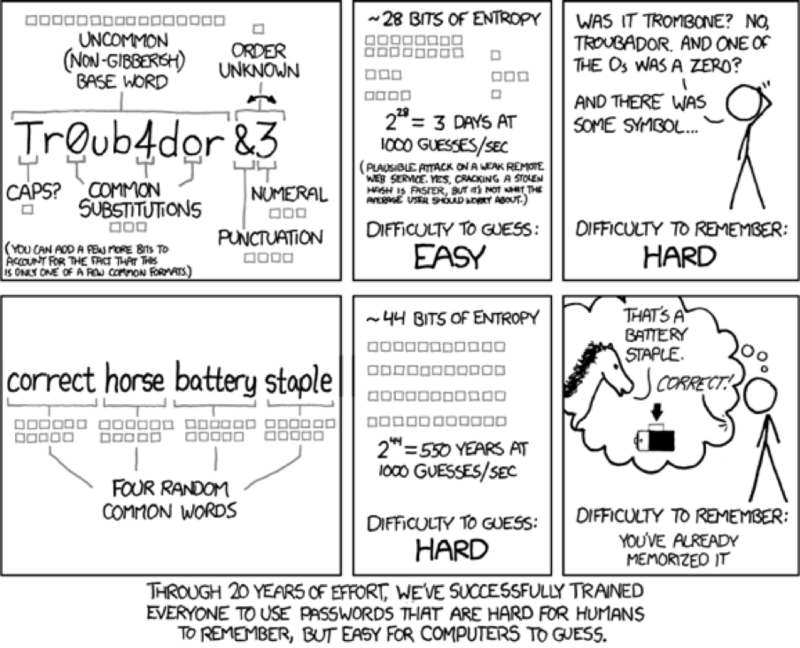 In my experience analyzing passwords over the years, I’ve learned that if the password is less than 13 characters, it was manually generated, not complex and easy to remember. You can get the script here, pull requests welcome. Also, as the encrypted data blob size increases, the estimated plaintext size margin of error decreases. This can allow an attacker to accurately guess the size of x509 certificates, SSH keys, and other data within the encrypted data bags. 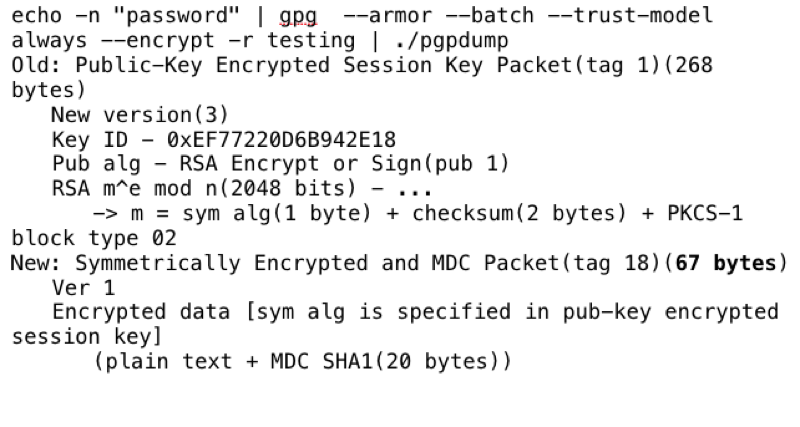 If you have previously used GPG/PGP, you’d be familiar with this output — it's an ASCII armored PGP message. AES-256-CFB – Cipher Feedback Mode, 16 octets (16 bytes, or 128 bits). 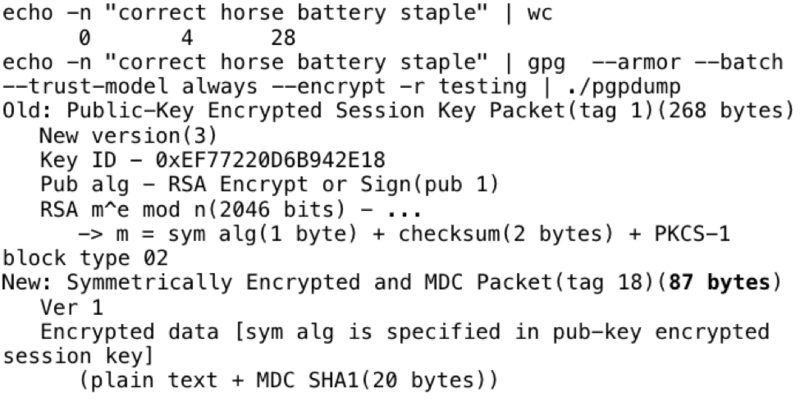 The "Symmetrically Encrypted and MDC Packet" is the part I'll be focusing on. In this instance, the data is 70 bytes. Just like with Chef Encrypted Data Bags, I'll need to find how small this packet can be with the default settings. To do so, I'll pass zero data to GPG and encrypt it. The packet is 59 bytes vs 70 bytes with the data from before, "supersecret," being 11 bytes in length. 70 – 11 = 59. Compression wasn't effective on this simple string of text. At what point does zlib compression become effective? 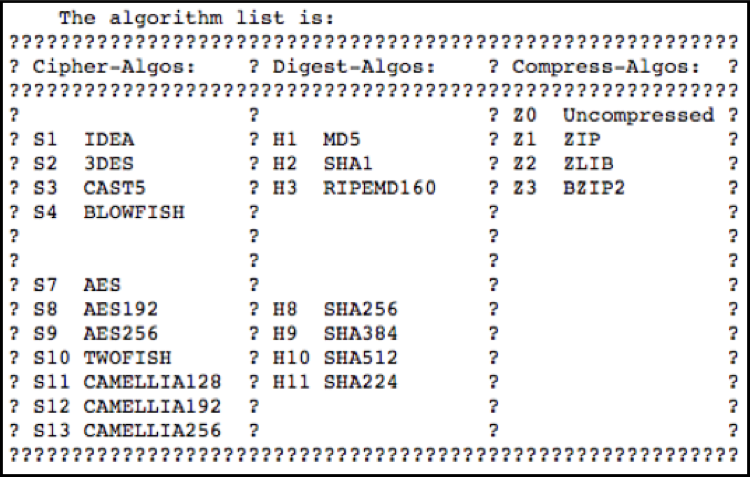 Zlib uses DEFLATE to remove duplicate strings, based off of LZ77, and bit reduction via Huffman coding. It's an easy algorithm to understand, but easier to observe when the compression is applied/effective via manual testing with gzip. 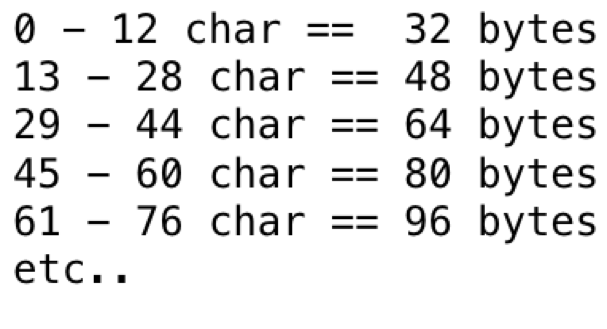 Compression becomes effective with the string “passssword” after four repeating characters. Note that a null byte string is still 20 bytes in length. From this test you can see that compression becomes effective only after the pattern is complete and is four characters long. Again, compression becomes effective only after three repeating two character patterns. “Password” is 8 characters so 59 + 9 = 67 bytes. 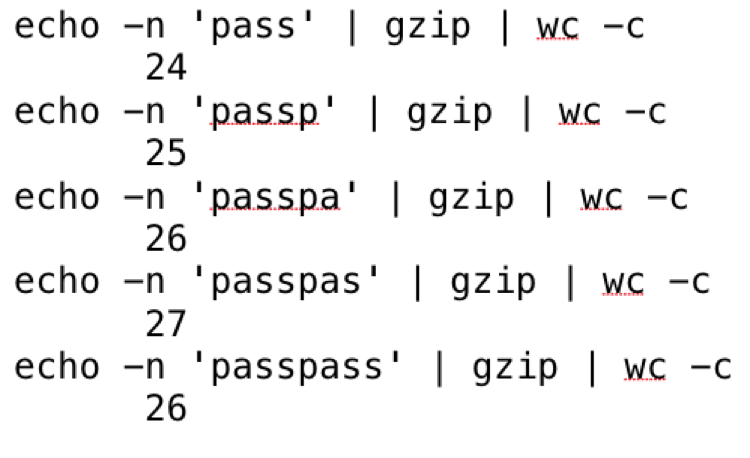 “Passssword” is 10 characters and 59 + 10 != 67 bytes, with a two byte loss from compression just like the gzip example. For years we've been drilling into our security community the concept of complex passwords and passphrases. 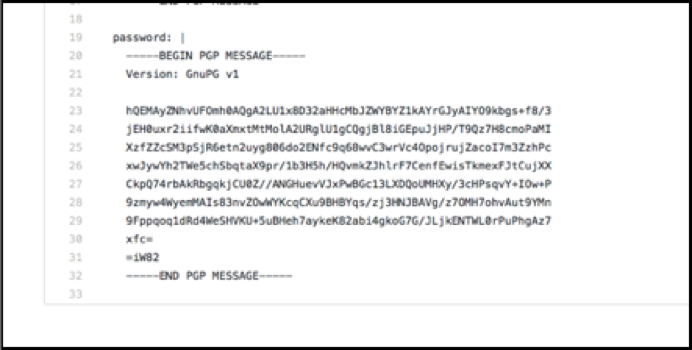 If you subscribe to that concept, use GPG for password storage, as SaltStack recommends, the length of your password can be accurately guessed if your encrypted files are compromised. It's not: 28 + 59 = 87. The same applies for complex passwords. The key point here, if you are auditing or get access to GPG encrypted secrets and want to see their password hygiene without asking for passwords, you now have that capability. 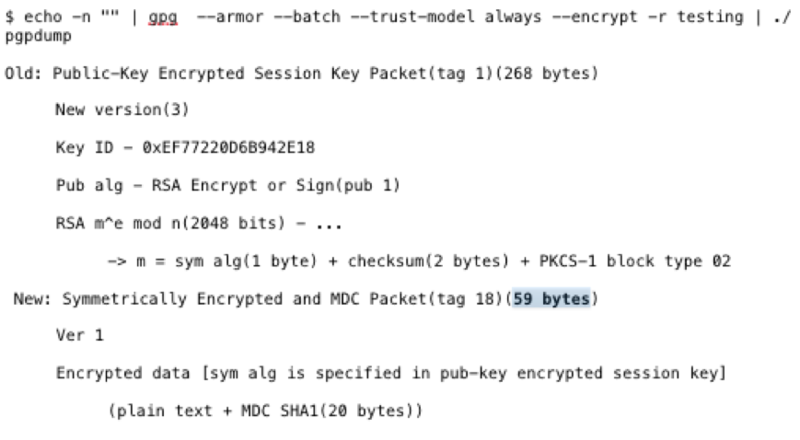 Pay attention to any Symmetric Encrypted Packets less than 71 bytes (~12 character password if complex). However, if they are using another symmetric encryption algorithm or compression, you will need use the same approach that I demonstrated to find the minimum length for that algorithm and compression method. If there is a short password in use, then an attacker could successfully brute force it. Comes out to a likely 6 characters in length (65 – 59 = 6). If you are using SaltStack and want to keep the length of your secrets secure, encrypt the entire pillar dictionary. One downside of this however, is that all the secrets are decrypted at once. Or if you are concerned with single use pillars for individual passwords, use long passphrases as the new NIST sp800-63 publication suggests. Josh Pitts is a staff engineer at Okta on our research and exploitation team. 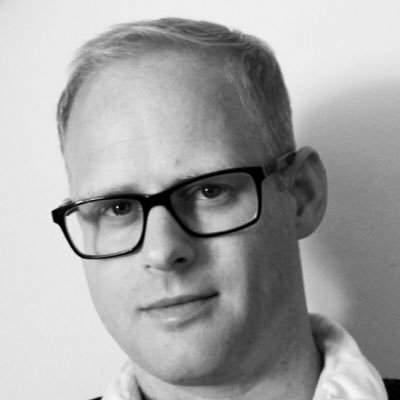 He has over 15 years' experience conducting physical and IT security assessments, IT security operations support, penetration testing, malware analysis, reverse engineering, and forensics. He likes to write code that patches code with other code via The Backdoor Factory. Sometimes this leads to the discovery of funny bugs and to Russians patching stuff over the Internet.